A New addition to NoFire's line of high quality, environmentally safe coatings, formulated to compete in today's lower priced and residential market places. Not designed to be used for hydrocarbon or jet fires, NoFire LP's fire performance under standard wood fire conditions is nearly identical to NoFire A-18. 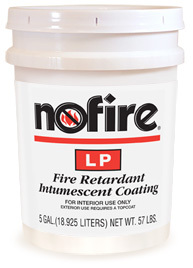 All "LP's" other properties such as low smoke and toxicity, environmental safety, durability, resistance to aging and deterioration are identical to NoFire A-18. "LP" is ideal for commercial and industrial OEM applications such as coating of wood products.